August 30 - September 3, 2018 CHECK US OUT ON FACEBOOK FOR MORE INFO AND UPDATES ! Portsmouth River Days is held each year beginning the Thursday before Labor Day. The festival opens on Thursday and runs through Labor Day Monday. 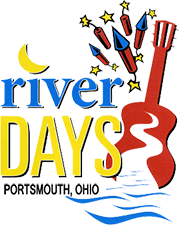 River Days is held on the riverfront at the Court Street Landing near the historic Boneyfiddle district of Portsmouth, Ohio. There is free nightly entertainment on the riverfront stage, arts and crafts, mid-way rides, lots of great food and more. Concerts begin at 6:00pm nightly. The Grand Parade begins at 11:00 a.m. on Saturday morning with the Queens Pageant at the Vern Riffe Center at Shawnee State University at 6:00 p.m. Sunday there will be Children's activities in York Park and at 3:00pm The Voice contest will be held on the riverfront stage, with evening concerts beginning 6:00pm ending with our Fireworks Extravaganza at 10:00 p.m. The annual Antique and Collector Car Show wraps up things on Monday from 9:00 am to 4:00 pm. Hope to see you at Portsmouth River Days 2018 !